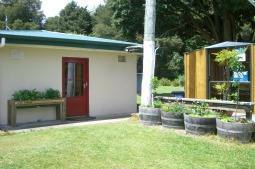 Here at Taumarunui Holiday Park we have something for everyone! We have a huge safe trampoline, a slide, a tyre swing, monkey bars – you name it! 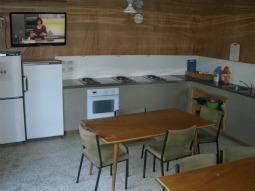 Taumarunui Holiday Park – your Mt Ruapehu accommodation – has a well-equipped communal kitchen with modern full-sized stoves, a microwaves, fridges and a colour television. There are also heaters to keep you toasty on winter nights. Our guest laundry has coin operated commercial washing machine and dryer. We have a tidy, clean ablution block with bathrooms, hairdryers, toilets and showers that are not metered! Dine outside true Kiwi-style with a gas BBQ provided free for our guests here at Taumarunui Holiday Park. There is also a BBQ area for outdoor dining with an open fire. We have an internet kiosk here at Taumarunui Holiday Park where, for a small fee you can keep in touch with family and friends or surf the world wide web! We have a dump station facility here at the park to easily empty your campervan or caravan waste.